So you can see taxes go up by the RMD% and the progressive tax bracket and by year 10 the single player is already at the 24% bracket. Who might the “single” be? Could be your widow if you kick at 79. 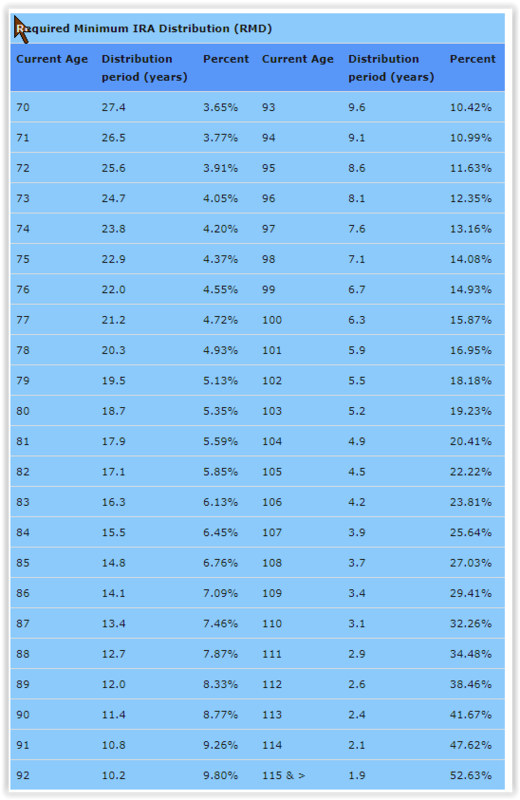 Here is a 600K TIRA RMD for 20 years at 6% and a 50K SS inflated at 2%/yr in 5 year snapshots. The top level of the married filing jointly 12% bracket is 104K taxable income. So a married filing jointly with a 600K TIRA @ 6% stays in the 12% bracket for 20 years if you live on just SS and RMD This is good to know. 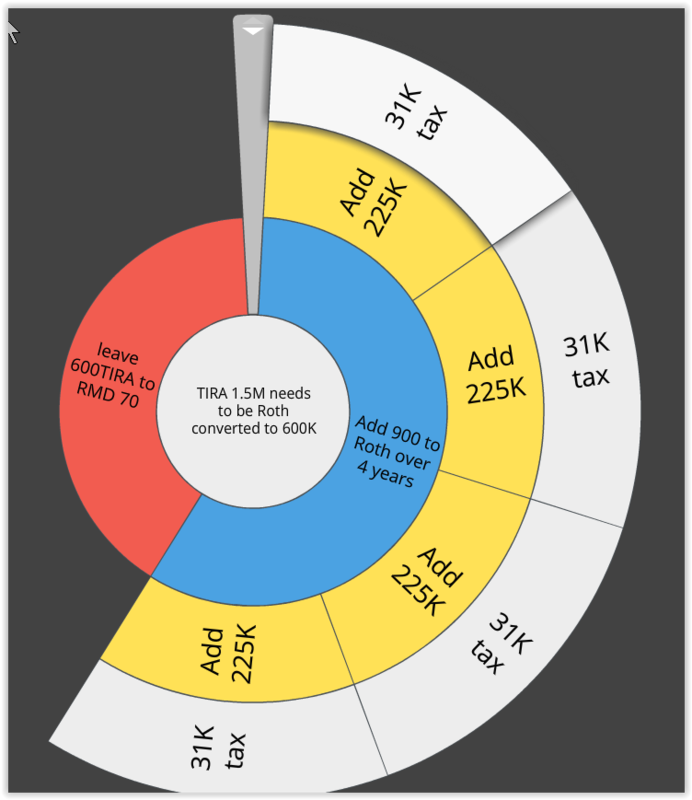 It means if you have 1.5M in the TIRA, Roth convert 900K before age 70 and you will minimize 20 years of taxes. If you have taxable money as well you can sell stocks at 0% cap gains tax up to a taxable income of 104K You be optimized baby! This is your late in retirement WR money, post age 70. I would call it the post age 70 WR epoch. 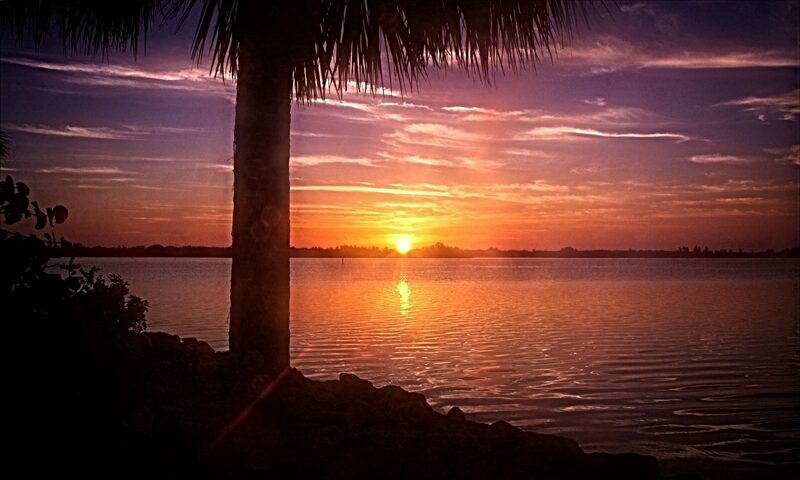 What you live on pre age 70 needs to be developed separately. You have confirmed what I thought once I started performing these calculations. These tax deferred instruments were designed to fund a middle class lifetsyle. Fair enough. Once one recognizes that, you simply reverse engineer to make it work for you. My eyes glaze over when folks whine and complain about that. Like you and I, we plan decades ahead so that we can try to mitigate the risk and optimize. We spend our energies on constructive pursuits instead. 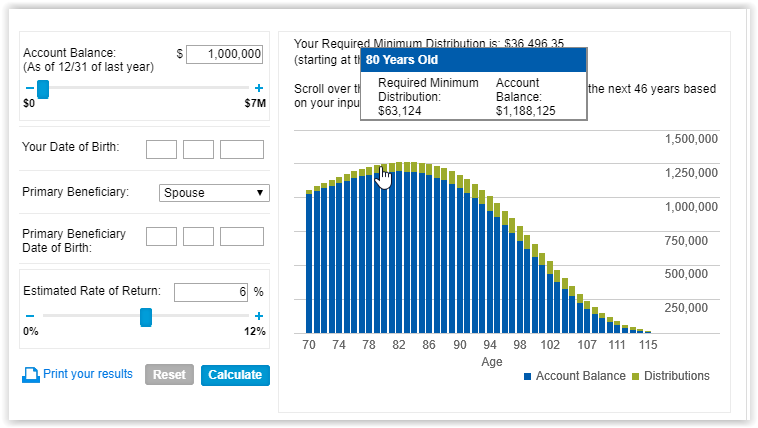 The Schwab RMD calculator was the first tool I used that demonstrated the potential future issues with RMD. The ability to adjust anticipated returns and mouse over future RMDs is very beneficial. It was integral in my decision to switch to Roth only retirement contributions since 2012. 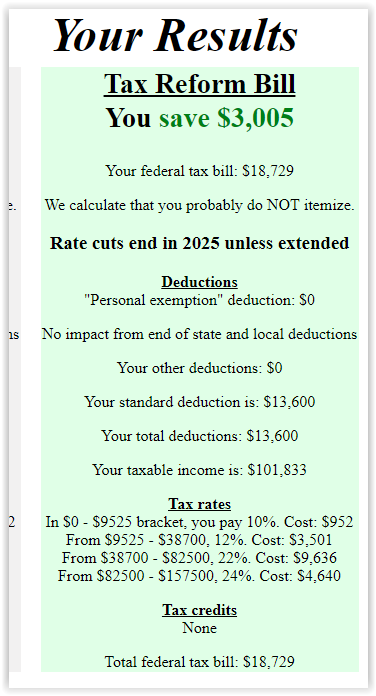 Even with this decision, at a 5% yearly return my marginal tax rate would likely be in one of the upper two brackets by my mid-80s and beyond. As you’ve often noted, many of those still in the accumulation phase either ignore or just give a cursory glance towards the issue. 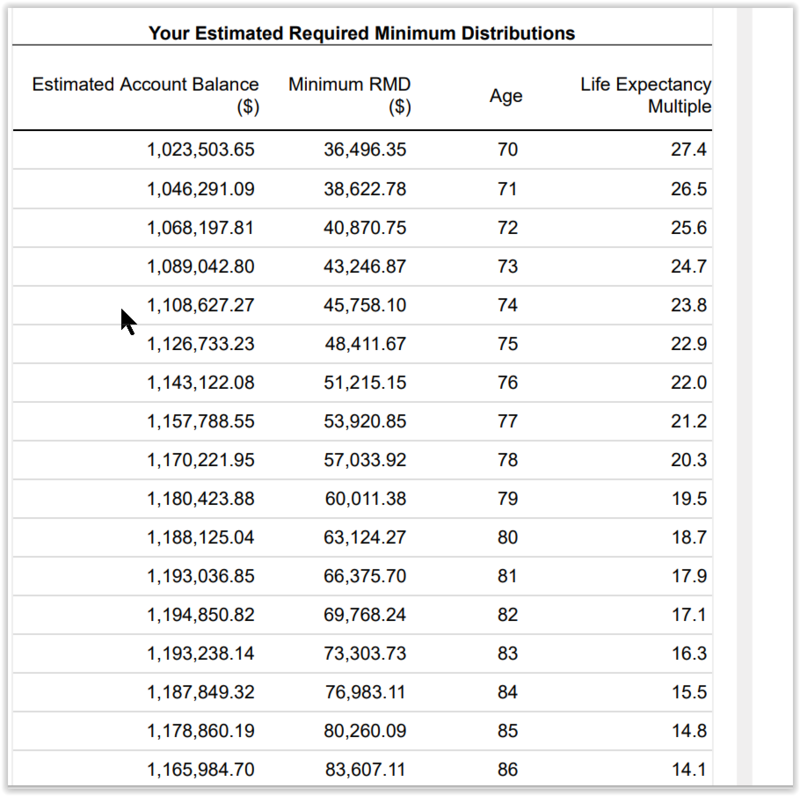 The analysis is usually limited to using the IRS RMD table and noting the age 70 life expectancy for use in the calculation. Unfortunately the damage is cumulative and really becomes apparent later as your RMD grows while you age. I’m enjoying the review of the quant tools you use for optimization of the various aspects of a retirement portfolio drawdown. It’s definitely more a game of chess than checkers. The thing of it is the result is entirely tune-able. I was at first going to Roth convert it all to the top of the 24% which has a 64K/yr tax bill and the cost of SS is maximum and there is a 3.8% surcharge so I reconsidered to a lower amount. The problem is if you convert only to the top of the 12% you don’t clean out enough money to matter or you have to convert for like 10 years which is quite expensive from a living expense point of view. At 100K/yr you need a cool million in cash plus the taxes for 10 years. So I settled on 1M conversion. It turns out I have already taxed money in my TIRA since I contributed after tax which adjusts the basis. The govt only taxes you once on TIRA as ordinary income so that gives me a tax break forever on my TIRA money so I can pull out $250K and get taxed on $214K. The tax on 214K is only 33K so I save 32K in taxes which remain invested in the Brokerage acct making money. So my net conversion cost is 400K living expense plus 4 x 33K tax or 532K for 4 years of retirement living and conversion. I had Tax Loss Harvested so I converted the 532K for zero tax. So my net cost of 1M conversion is 132K/1M or 13 cents on the dollar and the Roth will just sit there compounding hopefully never to be touched but available if it hits the fan. I will RMD what’s left of the TIRA and adjust the stock bond ratio to give me the rate of return I desire for the TIRA to keep me in the 12% bracket because that keeps my capital gains on the brokerage at zero. I will adjust my income by selling appreciated post tax stock at zero cap gain. So my income is SS which has a tax break and inflation adjustment built in (85%), plus RMD which grows fairly slowly and I have plenty of 12% bracket headroom, plus I’ll convert some post tax brokerage at zero cap gain and pay for medicare tax free out of my HSA. My tax bill will be strictly based on .85*SS + RMD + a little dab of dividend income. I count the TIRA as an annuity and not part of the WR since I am forced to take it. I count SS as not part of the WR since it comes by default. The HSA does what it’s designed to do tax free so all of these are essentially fixed predictable income with growth adjustments. My WR comes from the taxable and is variable based on my need. Normal is about 1.4% and if I want a car I may go to 2.8% for that one year. Since I’m over funded, and old, I don’t need 13% return and its risk to make this plan work, which further reduces my SORR risk and increases my probability of success.